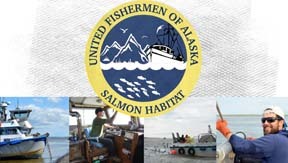 United Fishermen of Alaska has posthumously named Michael Bangs of Petersburg as its Fisherman of the Year for2018. Bangs was an industry leader in the development of the roe-on-kelp and dive fisheries in Southeast Alaska and former president of the Southeast Alaska Regional Dive Fisheries Association. He had been Chair of the Southeast Regional Subsistence Advisory Council and served on that body since 2003, and also served on the Petersburg Fish and Game Advisory Committee. He passed away at his home in February.